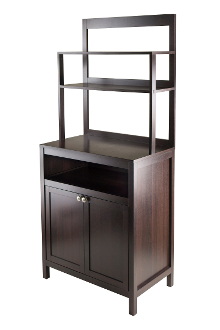 If you need more storage in your kitchen, then the Jamie Cabinet with Hutch is the perfect solution. The shelf comes with plenty of storage with two shelves for storage on the hutch, a spacious counter top, an open shelf and a large cabinet with double doors. Top shelf is 30"W x 10.2"D and bottom shelf is 28.7"W x 10.2"D. Counter top surface is 27.1"W x 17.4"D. Opening storage is 27.1"W x 17.6"D x 7.9"H. Double doors open to a storage size of 27.1"W x 16.8"D x 19.6"H. Made from solid and composite wood. Assembly required. Open storage is 27.1"W x 17.6"D x 8"H. Cabinet opens to storage of 27.1"W x 16.9"D x 19.7"H.